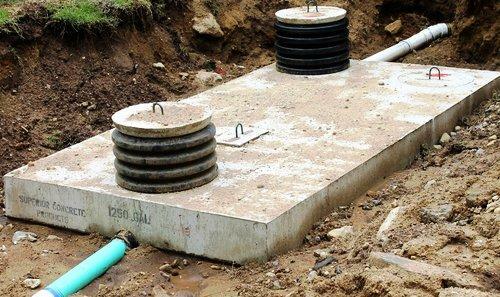 Septic tank is a serious project and its maintenance and repairs should be left to licensed professionals like us in MegaSeptic, who understand the construction and composition of the system. Range of septic tank repairs varies from replacing the bacteria inside the system all the way to replacing pipes or even digging a new drain field. In case of a broken pipe our professionals at MegaSeptic can determine the problem which your septic system may encounter. The septic system uses pipes to carry your household waste to the septic tank. Those pipes could break when tree roots grow into them or when the soil around the pipe shifts and changes or pipe material due to usage simply deteriorate and brake. In case of not repairing the damaged pipe, it could lead to pollution of the surroundings including spreading the bad smell even infection because waste is not ending in the tank yet in your backyard. The cost of these repairs could be really high depending on the damage. That is what we, in MegaSeptic can determine and look for the best and most affordable solution for you. Your septic system has a drain field. It is a section of a land reserved to filter water from the septic tank. The problem is, as everything in life, it doesn´t last forever. When bottom and top layers inside the tank grow to a firm thickness, it leaves a very little space for water, making way for grease and solid waste to slip into the drain field. When this occurs, the soil gets clogged in the leaching area, leaving contaminated water and waste to rise easily to surface. In some cases Nature interferes leaving microbes who also clog the soil to a point when you are faced with only one option left, digging a new drain field and this costs could rise pretty high. To avoid the worst case scenario, our team at MegaSeptic can do the checkup of your septic system and point you the potential problem.